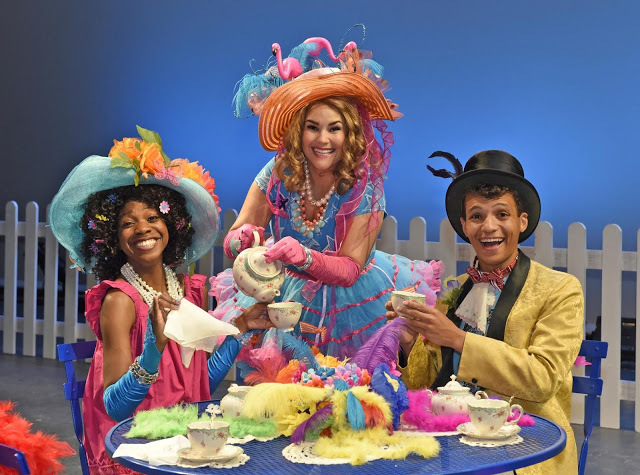 Dallas Children’s Theater Season opener Fancy Nancy: The Musical will have families dancing and discovering what it truly means to be fancy! The trés irresistible world of the fanciest, funniest kid to ever take the stage opens Dallas Children’s Theater’s (DCT) 2015-2016 Season. Fancy Nancy: The Musical based on the popular book series by Jane O’Connor with Book & Lyrics by Susan DiLallo and Music & Lyrics by Danny Abosch runs at DCT September 18 – October 25. Nancy’s refined etiquette is not enough to get her the lead role in the upcoming school play. She must summon the strength to forge ahead when a sudden turn of events casts her best friend as the lead. Every kid can relate to Nancy, with her boisterous attitude and tangled up feelings. Grown-ups will be equally dazzled while noting the heartwarming lessons that we never outgrow. The Mermaid Ballet recital, complete with a scene-stealing dancing shark, will have spirits dancing and all children hysterically happy. With DCT’s Fancy Nancy Costume Contest, some of Dallas’s youngest designers will have their designs showcased in the lobby with the grand prize costume designers’ work revealed on stage. DCT Costume Designer Lyle Huchton has been overwhelmed by the creative designs submitted and looks forward to working with these budding young artists. On September 19 following the 4:30 performance, the Fancy Nancy & Friends Party will be held with fun, food, and activities for the whole fancy family. Tickets are $50 each with proceeds benefiting the Student Matinee Performance Series. Join us an hour prior to the show for our first opening night event of the 15-16 season! The fun includes hands-on crafts with Oil & Cotton and the chance to interact with underwater friends from The Dallas Zoo! There will be face-painting, giveaways, and free mini-cupcakes from Sprinkles! Fancy Nancy: The Musical by Jane O’Connor with Book & Lyrics by Susan DiLallo and Music & Lyrics by Danny Abosch will run at DCT September 18 – October 25. including an ASL performance and a sensory-friendly performance. For tickets or more information visit dct.org or call the box office at 214-740-0051. Season tickets are on sale now.